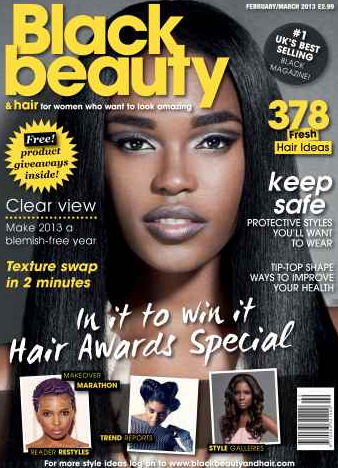 Hair styles and grooming techniques have always been important in the African and African American communities, as well as throughout the African Diaspora. The Afro comb has long been a tool that is used to create eye-catching and cultural relevant hairstyles for men and women of African descent. The Afro comb serves as a status symbol in many African societies and has for centuries. The comb has also come to denote affiliation with certain groups or tribes and can signify one’s religious beliefs or rituals. In ancient society and in modern times, the handles of the combs are adorned with objects that artistically showcase a person’s status. These include human figure, motifs and pictures of elements in nature. Spiritual artwork is often depicted on Afro combs as well. There are also archaeological burial records that indicate that some variation of the Afro comb has been around for thousands of years. Studies show that the comb is around 6000 years and originated in Africa before re-emerging in Britain, the Americas and the Caribbean. Around the 20th century, Afro combs started to take on a definite cultural and political meaning. 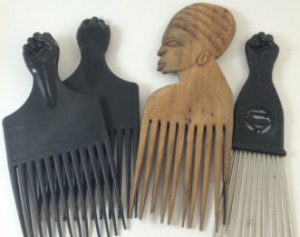 The “black fist” was added to the bottom of many Afro combs, which is a reference to the Black Power salute that was made popular by the Black Panthers. The Black Fist comb was introduced in the 1969 by Samuel H. Bundles, Jr. and Henry M. Children (Tulloch). In addition to using it as a styling tool, many black men and women wore the picks in their Afros as a way to express their cultural pride. The decade was also a time when more black women were deciding to wear their hair in its natural state, instead of pressing it and attempting to conform to a European standard of beauty. Another variation of the Afro comb, the folding comb, was introduced in 1970 and patented in 1971. 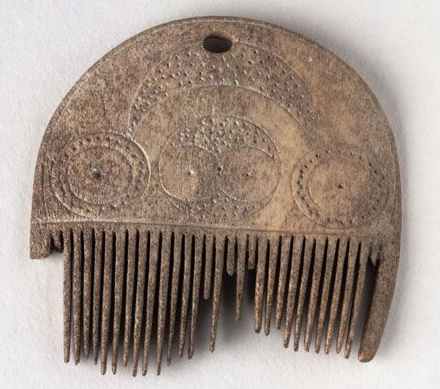 Today, Afro combs are often viewed as collector’s items. 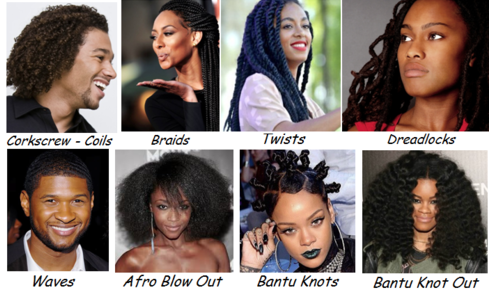 However, many black men and women who wear their hair in its natural state used wide-tooth combs and Afro picks to detangle the hair and help it keep its shape. The combs are truly a work of art, and have recently been featured at Cambridge University’s Fitzwilliam Museum.